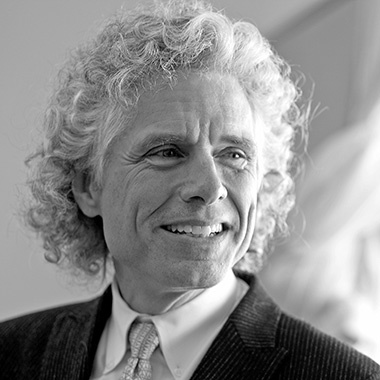 (1954, Canada) An experimental psychologist who conducts research in visual cognition, psycholinguistics, and social relations, Steven Pinker is currently Johnstone Professor of Psychology at Harvard, he has also taught at Stanford and MIT. He has won numerous prizes for his research, his teaching, and his nine books, including How the Mind Works and The Better Angels of Our Nature. He is an elected member of the National Academy of Sciences, a two-time Pulitzer Prize finalist, a Humanist of the Year, and one of Foreign Policy’s “World’s Top 100 Public Intellectuals” and Time’s “100 Most Influential People in the World Today.” He is Chair of the Usage Panel of the American Heritage Dictionary, and writes frequently for The New York Times, The Guardian, and other publications.